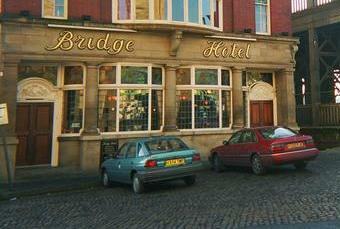 General information: If a great location is what you’re after, then The Bridge Hotel offers one of the most spectacular in Newcastle. 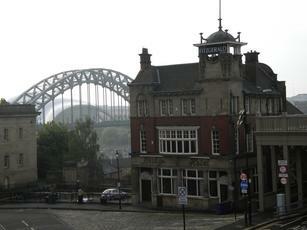 Just two minutes walk from Grey Street and the Quayside, and right next door to the Castle Keep and the High Level bridge, you’ll find stunning views of the River Tyne from both the pub and outdoor terrace. Built on a medieval site, the Bridge Hotel is a traditional venue boasting quiet secluded areas, cosy Victorian snugs, wooden panelling and carved fittings, together with stained glass windows and highly detailed mosaics. The atmosphere is just as impressive, and the friendly staff offer a true local Tyneside welcome to huge variety of customers who visit the venue for its history, its impressive programme of live entertainment, its outstanding reputation for serving a huge choice of cask ale, and its mouthwatering menus. What more could you want? 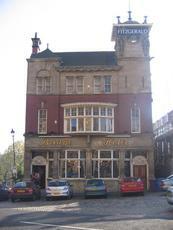 A pleasant pub in an enviable position. Not very busy early Sunday afternoon, so service was excellent & my pint of Doom Bar (3.00) very good. On reflection I seem to be choosing Doom Bar a lot on this trip, I must get more adventurous! Really good pub, plenty of room, good ale range, central location, football on the box, decent pub grub, pies available etc, what's not to like? A bit of a contrived kind of place when it has no need to be. Once again - in an empty pub the few people that were in crowded round the bar obstructing a view of ales on offer and getting to the till. Found the ale in here a bit iffy. Haven't been here since 2006, liked it then still like it now. Two visits, Monday evening and Thursday lunchtime. Quiet both times but service quick and friendly. Beers were good and the beef stottie, chips and gravy set me up nicely for my 6 hour trip south. Historic establishment by the the High Level Bridge from which fine views can be had of the Tyne and it's other bridges. There were 10 handpulls and we had Habour pale from Cornwall, Firebrick Brewery coalface and Anarchy smokebomb. Nothing wrong with the quality and the range from light to dark was excellent. Here comes the gripe though. It was very quiet, about 7 customers but as soon as we sat down we were asked if we had reserved. Now this place is enormous and 95% of the tables were empty and with nothing on any to indicate reservations were present. Now we could therefore I guess have spent the next half hour playing guess the unreserved table so we went to the far side of the pub where apparantly we were safe, At no time were we offered any helpful advice on where to go. And after half an four we left and exactly the same 95% of the tables was available. That leaves a sour taste.